Youth Juries- What did we do? 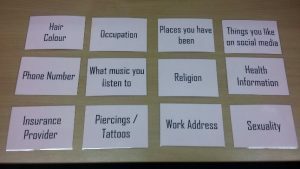 “This helped me understand what I’m signing up for online” (Questionnaire Feedback). “Really fun and makes you think about the internet and its dangers” (Questionnaire Feedback). Many recognised the benefits of algorithms, for example that they might help you to see things that you like or to learn new things. You also told us of some of your concerns about algorithms. For example, that algorithms may sometimes make mistakes and not show you things that you wish to see, or sometimes they may ONLY show you things that you agree with (this is called a Filter Bubble). Some were aware and others were unaware that their data is often shared with third party companies when using apps and websites. The team learnt about the data that you were happy to share with companies (for example, shoe size), and data that you were not always comfortable to share with companies (for example, your home address). Many described the sharing of some of this information as “creepy”. You told us about the actions that you used to spot fake news (for example, checking the source of the information), to help you to stay safe online (for example, putting your social media on ‘private’ or ‘ghost’ mode) and to tackle the power of the algorithm (for example, installing ad blockers). We learnt that many jurors felt powerless to influence some of the ways that the internet operates, for example not being able to fully delete information that is put online, and by confusing and lengthy terms and conditions. You gave feedback on how you think that the algorithm should be made to be more transparent to people of your age. 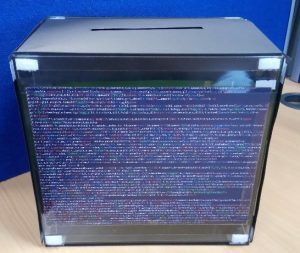 Some of you also put forward your own recommendations for transparency, such as using videos to communicate what an algorithm does. Terms and Conditions- make them simpler, clearer and shorter. More Control over Algorithms- be able to turn them on and off. Regulation- more regulation needed of advertisements, algorithms and of fake news. Education and Awareness Raising- needed in schools to raise awareness of these issues. Have you written any other reports? The team are also in the process of writing other reports and papers to share what we have learnt with others- including those that work in policy, industry and in academia. It is highly important to us that we continue to keep sharing the results of the Youth Juries, so that the online experiences of people in your age group, as well as your recommendations for how these experiences may be improved, are listened to by those that can implement change. 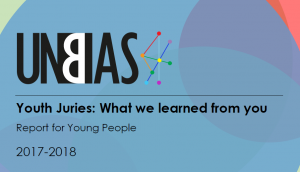 For a list of other reports and papers that we have written as well as the Parliamentary Inquiry that we submitted evidence to, please see ‘Youth Juries- what we learned from you’. Previous PostLooking forward to the UnBias Showcase! October 1st 2018, LondonNext PostOur UnBias showcase event!